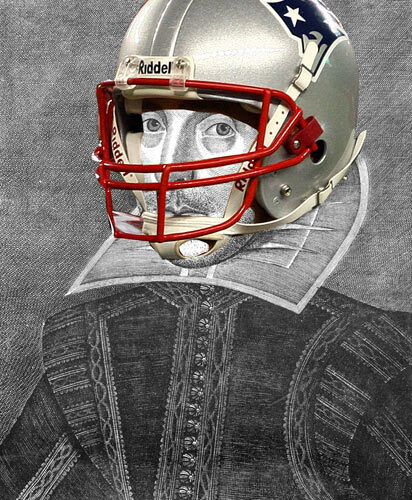 In Fair Glendale, the Bard's Super Bowl Play The ghost of William Shakespeare makes a rare appearance in Arizona, where the Giants of York and the Patriots of Old — er, New — England prepare for a mighty battle. Frank Deford and a cast of NPR reporters and hosts cover Super Bowl media day in verse. 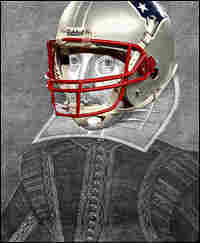 William Shakespeare, playing favorites in Sunday's Super Bowl. It's Wednesday, the time we usually hear from commentator Frank Deford. This week, though, the ghost of William Shakespeare makes an appearance. The bard was in Glendale, Ariz., the other day as the Super Bowl contenders met the media ... and filed this exclusive play. The Players: Sideline Wench, a reporter for the Duchy of Fox; Kornheisercranz, herald; Wilbonstern, herald; Brady, a fair-haired boy; Eli, a boy; reporters, bloggers, correspondents, cameramen, soundmen, hangers-on, sycophants, small children throwing rose petals. Our drama begins as a slovenly mob of sports journalists enters the field at the University of Phoenix Stadium. A fetching reporter, the Sideline Wench of the Duchy of Fox, steps forward. Dare confront the pretty Brady. Two heralds, Kornheisercranz and Wilbonstern, wearing hideous matching ESPN doublets, elbow the Sideline Wench aside. Waged by mesomorphs come from green Blue States afar. For they would better be the one, the other. Mere ciphers in the point spread, a goodly dozen down. Scoundrels in video deceit, cashing all manner of Belichicks. In his mortal company as e're this game is to sport. But soft! Let me look upon him as if I filled his embrace. Oh! A visage that Narcissus would have traded for! And a manner that knows neither pressure nor fear. And I, only a sideline wench who can but model dreams. And now Brady enters amid a crowd of admirers. Small children toss rose petals in his path. Before the din of questions that confront our great Brady. The Media: Brady, Brady what is afoot with thou? For always the feats I have achieved, were upon my two feet. One game at a time, one good foot before the other. For by rolling alone, there is no way for Moss to gather passes. Narrator (in hushed tones): And so Brady exits stage left ... and the heralds return. Wilbonstern:: But look now, who approaches from yon other way? No match for such a paragon as the dauntless Brady. Is as royal as Brady ever bought to his captured throne. He, who made stallions of Colts but twelvemonth past. Little David did when bookies of yore favored huge Goliath. Sideline Wench: So, withal, is the grandeur of Brady match for the legacy of Eli? With that I take to silence and send it back up to the big boys in the booth. And so the curtain falls on our Super Bowl drama ... with apologies to Shakespeare and thanks to our weekly sports bard, commentator Frank Deford, who played the part of Kornheisercranz. Thanks also to Sylvia Poggioli, who played the Sideline Wench, Neal Conan as Wilbonstern, Ari Shapiro as Brady and Steve Inskeep as the Narrator.